Prototek’s C1 combinationlLaser/turret punch presses offers many enhancedpProcessing capabilities, including tapping all common standard and metric taps and countersinking to decrease processing time and get parts to our customers even sooner. The addition of the Amada 4000 watt Pulsar 2415 5′ X 16′ Cell combines the latest developments in laser machines and automated loading/unloading technologies. 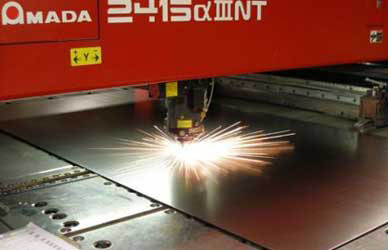 The Pulsar laser is a high speed production or short run sheet metal parts processing machine with parts productivity rivaling a turret punch and with the MP1225 Load/Unloader, and the MST1225 6 Shelf Tower System the 3 machines combine to make a productive cell for processing materials up to 1/2 thick steels and 3/8 thick aluminum. With this machines exceptionally fast operating speed and accurate cut over an extensive range of material gauges and types of alloys it allows us to process an incredible variety of parts without sacrificing productivity. Prototek Manufacturing feels we can service just about any customer that calls on us.